Seventeen overseas Filipino workers’ organizations and advocates belonging to the Coalition #No to 550 today called on millions of Filipino migrant workers all over the world to show a united front against the government’s move to integrate the airport terminal fee in all air tickets on February 1 despite a law exempting OFWs from paying the PHP550 airport fee. 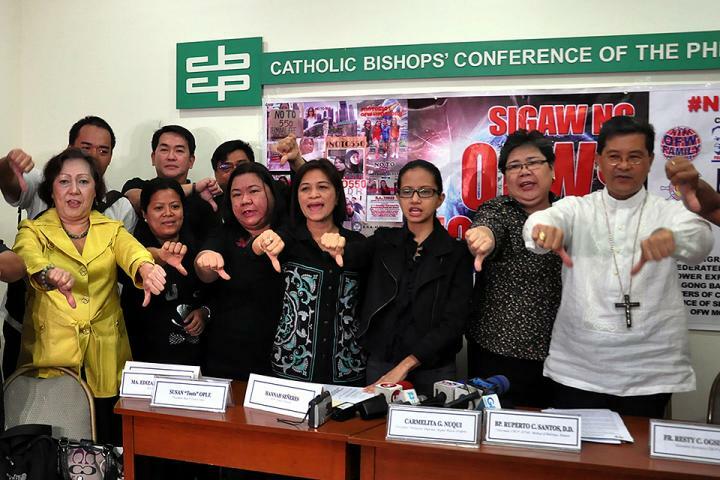 In a press conference held at the CBCP Building in Manila, the coalition members urged the Department of Transportation and Communications (DOTC) and Manila International Airport Authority (MIAA) to put on hold the International Passenger Service Charge (IPSC) scheme or the terminal fee integration until it can come up with a fair and lawful scheme that would honor the exemption granted to OFWs by law. Turn their profile photos into black on February 1, the date of the IPSC implementation. Join, support or duplicate the Coalition’s campaign against the IPSC in their respective areas by spreading the word about the MIAA’s new policy that would favor foreign airlines over the rights and welfare of OFWs. “Respect the law. That is all we ask,” the OFW groups said in its position paper, citing the provision in the 19-year old Migrant Workers’ Act of 1995 that bestows them exemptions from paying the travel tax and airport terminal fees. The group also urged Pasay City RTC Branch 109 to issue a decision on the OFW sector’s motion for a prmanent injunction against the IPSC. Under the IPSC, OFWs who purchase their tickets online or abroad would have to pay the integrated terminal fee then line up upon their return to the country at any of the NAIA terminals to claim a refund. The coalition members pointed out that nowhere in the law was there any mention of preconditions or a refund system attached to the exemption. “They are modifying or amending the law via a mere memorandum circular. What is alarming is MIAA’s insistence to implement the terminal fee integration by February 1 despite an ongoing court case wherein the judge has yet to issue a decision,” the OFW groups stressed. The OFW sector expressed full support to the move of the Senate to conduct its own inquiry into the IPSC on February 9, as well as the move of the House Committee on OFWs to cite MIAA for contempt for carrying out the implementation of the IPSC without informing the committee that has been carrying out an inquiry into the said policy. They said that the Senate should look into the IPSC particularly because most OFWs would not be able to claim a refund at the NAIA terminal. “Every minute of their brief stay in the country is earmarked for time with the family. Why shift the burden on the OFWs in asking them to line up for a refund of PHP550, for a fee that by law they are exempted from paying?” the Coalition explained. The Coalition also expressed concern over the unrefunded airport terminal fees paid beforehand by the OFWs who bought tickets online or overseas. Lito Soriano of LBS Recruitment Solutions, Inc.